Speculative fiction did very well in drama, but didn't make a single appearance in comedy or television movies and miniseries. "Stranger Things 2" earned the most nominations among drama series with four, tying "GLOW" in comedy series and "Big Little Lies" in television movies and miniseries. 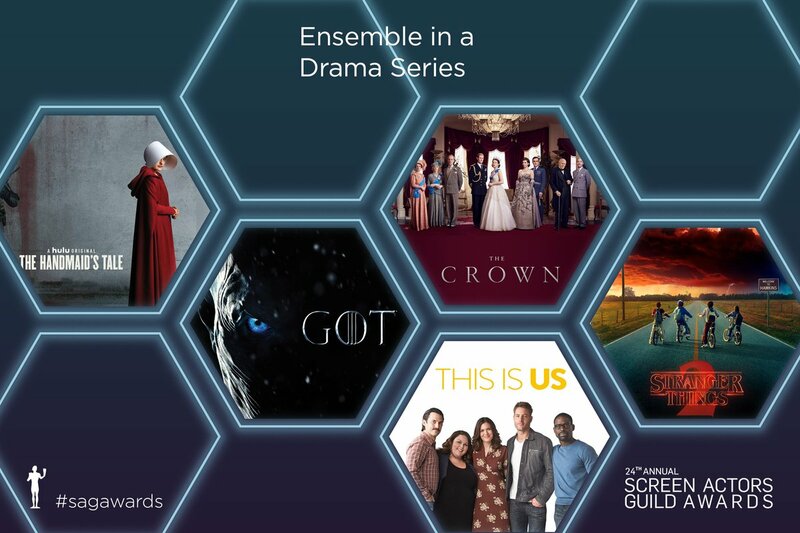 As the image above shows, it joined "Game of Thrones" and "The Handmaid's Tale" among the nominees for Outstanding Performance by an Ensemble in a Drama Series. Once again, speculative fiction nominees dominate drama. "Stranger Things 2" also earned two individual acting awards for David Barbour in Outstanding Performance by a Male Actor in a Drama Series and Millie Bobbie Brown in Outstanding Performance by a Female Actor in a Drama Series. As for whether it will win any of them, I think it might repeat last year's win for Ensemble in a Drama Series, as it beat "Game of Thrones." However, it didn't have "The Handmaid's Tale" or "This is Us" to contend with, both of which could upset it. I'm not optimistic about Barbour and Brown, as both have tougher competition in their categories, which they didn't win last year, either. In addition to its nomination for Ensemble in a Drama Series, Peter Dinklage is competing with Barbor for Outstanding Performance by a Male Actor in a Drama Series. I think Dinklage has a better chance of winning, but I am still giving the advantage to Emmy winner Sterling K. Brown for "This is Us." Elizabeth Moss of "The Handmaid's Tale" is competing with Brown of "Stranger Things 2" for Outstanding Performance by a Female Actor in a Drama Series and I think she has a better chance of winning as she won the Emmy. However, the returning winner is Claire Foy, so either of them beating her would be an upset. The closest speculative fiction came to being nominated in comedy, miniseries, or television movies was Geoffrey Rush as Albert Einstein in "Genius" for Outstanding Performance by a Male Actor in a Television Movie or Miniseries. 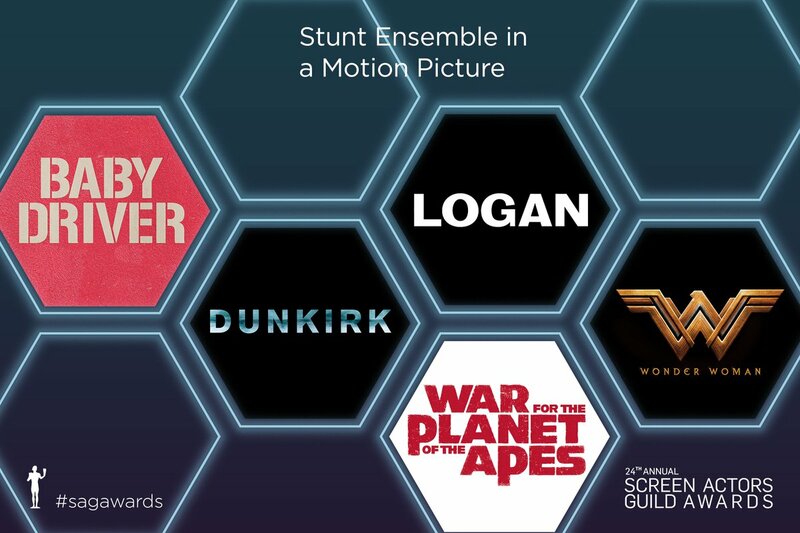 As great an actor as Rush is, he's not going to win against his fellow nominees, especially Robert De Niro or Alexander Skarsgard. As for comedy, I will have to settle for Kristen Bell of "The Good Place" as the host. Too bad she wasn't nominated, but that would have been awkward. Finally, I will once again let a picture speak its 1000 words for the strength of speculative fiction in Outstanding Action Performance by a Stunt Ensemble in a Comedy or Drama Series. 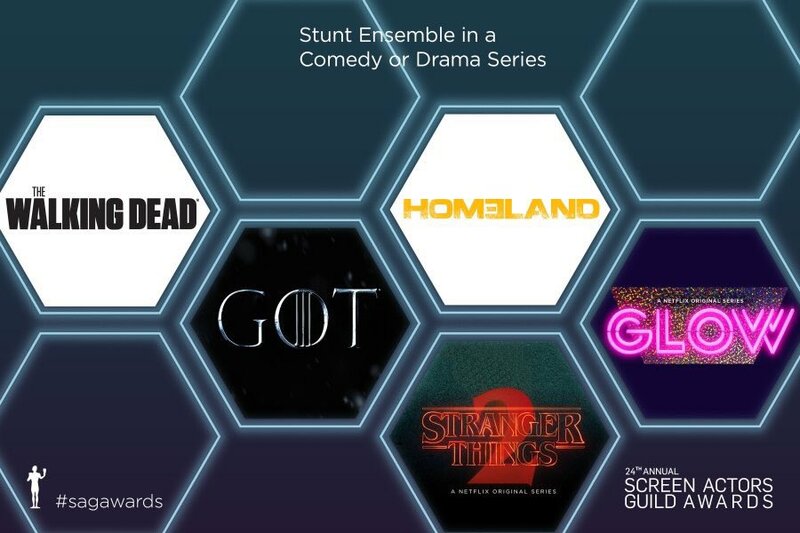 This category lists the fourth nomination for "Stranger Things 2," the third nomination for "Game of Thrones," and the only nomination for "The Walking Dead." I'm rooting for "The Walking Dead," but I think the award will go to "Game of Thrones" for the seventh consecutive time. Insert joke about White Walkers beating Walkers here. Stay tuned for an entry about the top political documentaries of 2017 tomorrow.